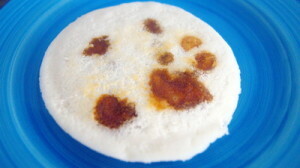 Bhapa pitha a sort of steamed cake made with rice flour, jagerry and fresh grated coconut. Pitha is actually eaten in winter time with new harvest rice and fresh jaggery (khejurer gur). All Bangladesh people have sweet memory to make Pitha in their childhood. In Bangladesh you can few hundred types of pitha. I feel proud to have rich food culture in Bangladesh. I used store bought rice flour to make it. But freshly grinned rice is the best. Please don’t compromise with jaggery(khejurer gur). 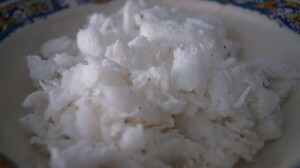 khejurer gur and fresh grated coconut are the essential for making Bhapa Pitha. I used rice cooker steamer instead of traditional bhapa pitha Hari to make life easier. Enjoy the flavour of Bangladesh. Also need small bowl, strainer, cheese cloth, traditional bhapa pitha Hari or rice cooker steamer. 1. 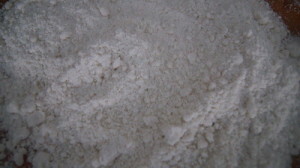 Mix salt with 5 tablespoon water. Add salty water with rice flour bit at a time and crumble flour. Water amount vary on rice to rice. I used all together 8 tablespoons water. 2. 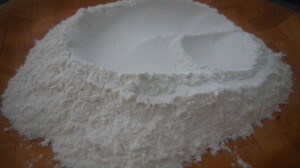 Sift flour (wet flour is not supposed to sift easily, use your hand to sift flour). You should get grainy texture. 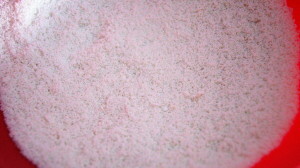 If you are not get grainy texture you should use more water. 3. Fill half rice cooker pot with water and turn on. Let it comes to boiling point. We need to close the rice cooker lid hole to keep steam inside the rice cooker. 4. 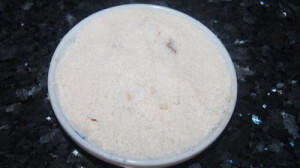 Take small bowl spread grainy flour to cover the bottom, put some grated coconut and jaggery, and cover it with flour and press gently to make it plain on top. 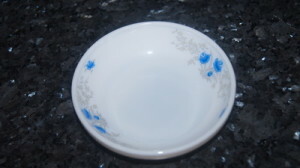 Now cover the top of the bowl with dump cheese cloth. 5. Flip the bowl on the rice cooker steamer and steam it 5-6 minutes (if you are using traditional bhapa pitha Hari, it will take 4 minutes or less). 6. 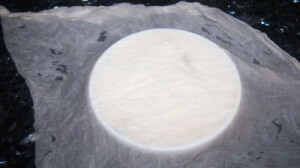 Take out rice cake and remove cheese cloth. Repeat the process to finish rest ingredients. It will make about 8 large cake / pitha. 7. Enjoy hot Bhapa Pitha the flavour of Bangladesh. Apu, thanks a lot for the recipe. will try it soon. but i want to know one thing that how did u close the steamer hole of the rice cooker? Use flour dough to close the hole.Thanks. 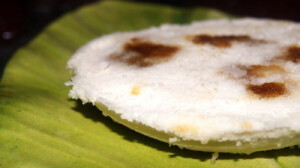 Bhapa pitha has similarity with idly. Jaggery (Khejurer gur) makes sweet and awesome tasty. Thanks.